Ram has never been an automaker that prided itself on being the fanciest looking in the garage. 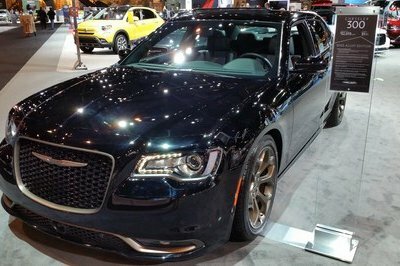 As its name suggests, the automaker has preferred function over form since its split from Dodge. And as such, its parent company, Chrysler, has used the 2013 Chicago Auto Show to introduce the newest Ram, the 2014 ProMaster. 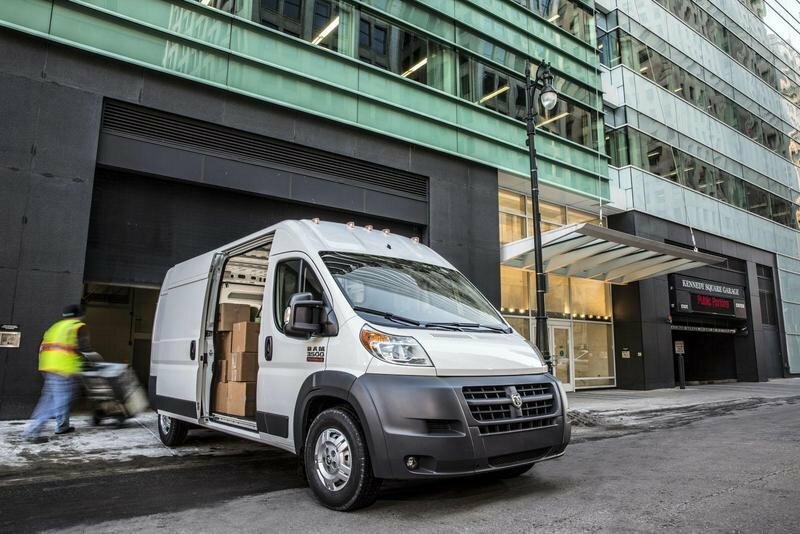 With some help from Italian tag-team partner Fiat, Chrysler has come up with a full-sized cargo van that just about boasts of every class-leading category in the market. Or at least that’s what Chrysler claims. Whether there’s validity to that really depends on what you’re looking for in a cargo van. Fortunately, we found enough things about the ProMaster that we actually like. 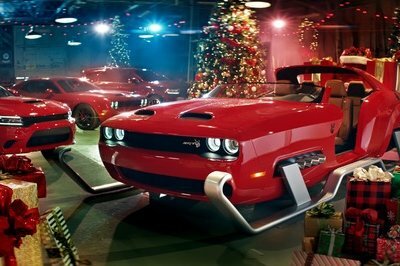 So much so that we’re not going to brush aside Chrysler’s incessant promotion of it. Maybe they do make a point. Or maybe they’re just drumming up the hype machine. Either way, the 2014 ProMaster is here and by the looks of things, it’s here to stay. If you’re looking for a groundbreaking visual design on the Ram ProMaster, prepare to be disappointed. See, a cargo van like the ProMaster will never be appreciated for its design. Having said that, the look of the ProMaster is a welcome departure from the boxy old vans. That, in itself, is a design victory. The most noticeable thing about the van is the enormous wraparound bumper with the Ram logo prominently — if not looking out-of-place — displayed in the middle of the grille crosshairs. Equally important is the construction of that front bumper, which comes in a three-piece styled modular design that cuts down repair costs should you get in a little fender bender. The front-wheel arches are styled with the bumper, creating an illusion that makes the latter extend all the way past the wheels. Notice also the relative absence of windows on the cargo. That’s an intentional design that can be taken advantage of by businesses who’d want to post whatever signage, advertising, or graphics they’d like to promote. 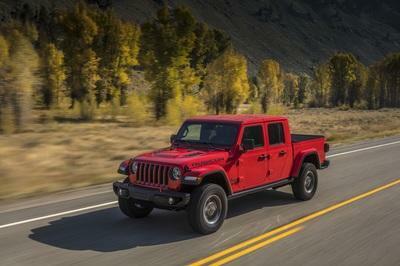 With what it claims as best-in-class payload capacity of up to 5,145 pounds and a maximum towing capacity of up to 5,100 pounds, matched with a gross combined weight of 11,500 pounds for the 3.6-liter V6 and 12,500 pounds for the 3.0-liter four-cylinder EcoDiesel, the Ram ProMaster has high hopes of becoming what the rest of the competition can only claim to being: the best in its class. "The functional and innovative features of the ProMaster owes itself to its European doppelgänger, the Fiat Ducato". As a commercial vehicle whose primary purpose is to transport a huge amount of goods from one place to another, the cabin of the ProMaster is devoid of anything that can be deemed a luxurious amenity. As well it should, because very few people will drive something like this with a joyride in mind. The functional and innovative features of the ProMaster owe themselves to its European doppelgänger, the Fiat Ducato. Ram did make some alterations to ensure that overall function is put under premium importance. That was no more evident than the rear cabin, which has been fitted with up to 17 tie-down rings with 1,000-pound rating that fold away, ensuring that the floor remains flat so loading and unloading is easier and that all the cargo you’re bringing remains held down on the floor without risk of toppling over and making a big mess of your cargo. Roof height is another source of pride for the ProMaster, which Ram claims as having the best in its class. 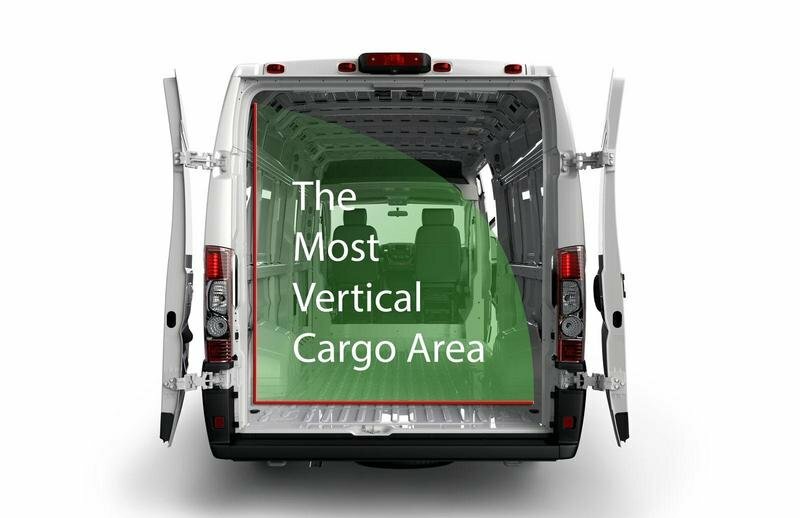 The choice is 90" (229 cm) or 101" (257 cm), allowing for even a tall driver to be able to stand up inside the van without bumping his head. One gas and one diesel; those are the choices you have if you’re fixing to get grimy with the Ram ProMaster. The standard powertrain on the ProMaster is the 3.6-liter Pentastar V6 engine, rated at an impressive 280 horsepower and 260 pound-feet of torque. This engine can be described as a coup for the ProMaster after having been named one of Ward’s 10 Best Engines in the past three years. Should you opt though for the diesel variant, Ram is offering the 3.0-liter in-line four-cylinder EcoDiesel engine - the first time this powertrain hits North America - that produces 174 horsepower, almost 100 less ponies than the V6 version, and a peak torque of 295 pound-feet. Despite possessing less power, the EcoDiesel variant does come with refinements of its own in the form of new internal engine components, turbo and emission controls. And besides, oil-change for the diesel is won’t be needed until around 18,500 miles as opposed to 10,000 miles for the V6. That’s a win for the EcoDiesel. Transmission is also a matter of choice between the smooth-shifting 62TE automatic transmission that has been upgraded to accommodate the ProMaster’s weight ratings and the new M40 automated manual transmission that functions like an automatic, thanks in large part to an electro-hydraulic actuation system that handles the gear shifts and clutch functions. This transmission is also exclusive to the 3.0-liter EcoDiesel and a big component of why the ProMaster it stands alone in the Ram ProMaster’s competitive set. As a carrier of heavy things, the ProMaster is capable of hauling up to 2,333 kg (5,145 lbs) with a maximum towing capacity of 2,313 kg (5,100 lbs) and a maximum roof load of 182 kg (400 lbs). RAM has yet to announce pricing for the 2014 ProMaster, but you can be sure that it’s going to be around the range of the prices of some of its competitors, including the Ford E-Series and the Chevrolet Express (somewhere between $26,000 - $30,000). Whatever the case may be, we’ll be sure to give you the numbers the soonest they become available. The Mercedes-Benz Sprinter has all the necessary tools and features that can supplant the ProMaster in its own game, including that ever important cargo volume with the Sprinter boasting of 547 cubic feet of space compared to the ProMaster’s 530 cubic feet. Power though goes to the ProMaster, particularly if you opt for the 3.6-liter V6. The EcoDiesel is right around the Sprinter’s 3.0-liter V6 engine, which only nets 188 horsepower, compared to the ProMaster’s 174-horsepower 3.0-liter in-line-four EcoDiesel. Ultimately, the choice between these two can be attributed as a toss-up. If you want one that offers more premium luxury to go with a higher price tag (around $36,000 - $45,000), then the choice is the German van. But if you want to spare a dime or two, then it’s the ProMaster. 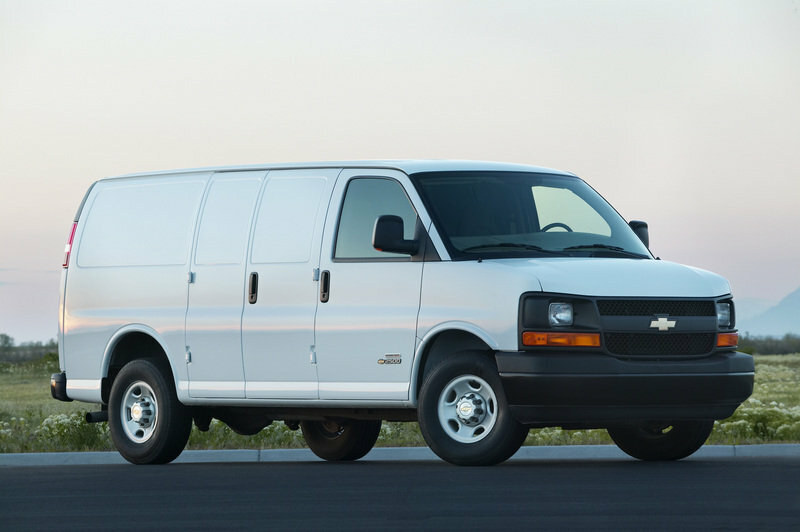 Arguably the most powerful of all cargo vans, the Chevrolet Express is a double-edged sword of power and efficiency. Sure, it boasts an optional 5.3-liter V8 engine that produces 310 horsepower but it also gets thirsty faster than most of its competitors with a fuel economy of 13 mpg in the city and 17 mpg on the highway compared to the 20 mpg combined for the ProMaster. 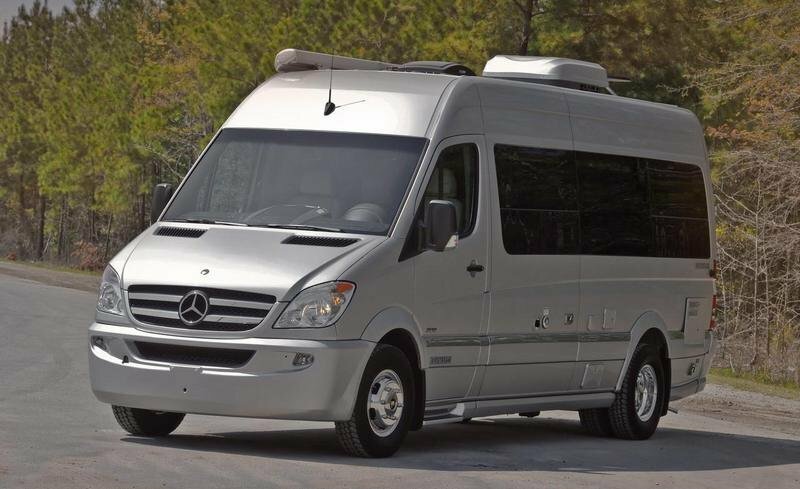 It’s cheaper than the Sprinter by a significant margin at $28,940, so you can take the good with the not-so with the Express. Ram sure has a way of promoting the ProMaster. Not one to be shy about what it thinks of its products, the American automaker listed down some of the highlights of their new cargo van, including best-in-class standings in fuel economy, cargo capacity, payload, total cost of ownership, powertrain warranty (5 years/100,000 miles), turning radius, interior ceiling height and step-in height. Given that they do have some backing to those claims, the ProMaster offer plenty of what you’re looking for in a cargo van. Whether you need cargo capacity, power, or fuel efficiency, the ProMaster has them in spades. And it certainly doesn’t hurt that relative to its segment, it’s got a pretty modern styling design to it, too. 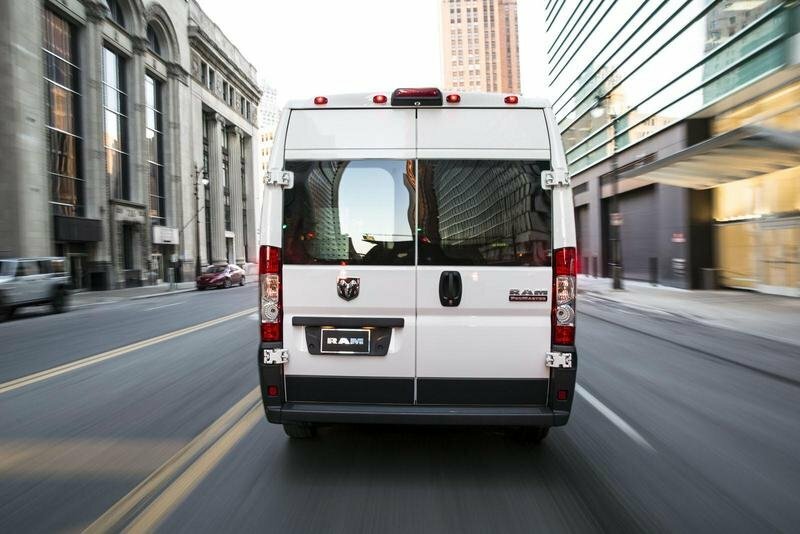 The new 2014 Ram ProMaster is Ram Commercial’s latest addition to its popular vehicle lineup. 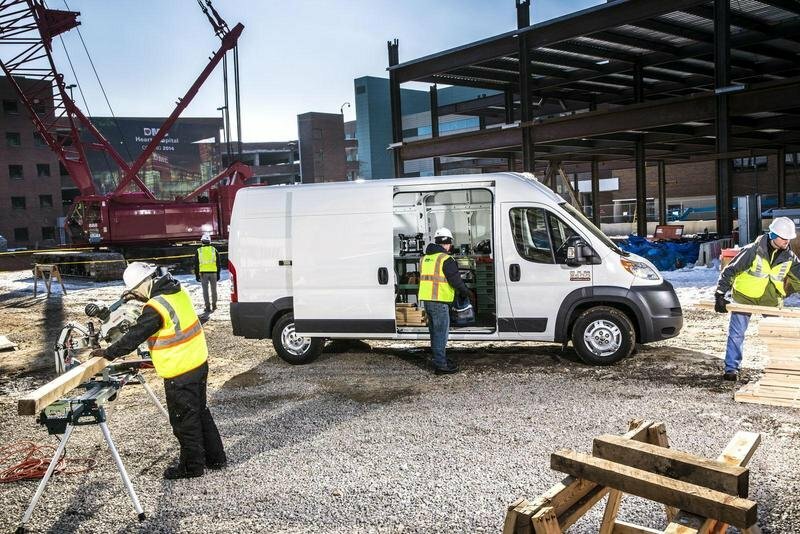 ProMaster takes its place in the expanding, purpose-built, full-size van segment with a number of best-in-class features focused on the commercial customer. Coming from a strong background of commercial vehicles produced by Fiat Professional, the ProMaster is based on the Fiat Ducato, which has been in production for more than 30 years. ProMaster boasts numerous best-in-class features that are appreciated by the hard-working customers of Ram’s new van. Best-in-class fuel efficiency, cargo capacity, usability and of course total cost of ownership all combine to deliver a proven solution for businesses and fleets. Ram Truck is tapping into Fiat Professional, one of the largest producers of commercial vehicles in the entire world, offering more than 110 years of experience. That knowledge will help Ram Truck enter new segments and expand its product line. The new 2014 Ram ProMaster is based on the front-wheel-drive Fiat Ducato, which is the most popular full-size van in Europe. The 2013 Ram ProMaster is the Company’s first shared truck collaboration with Fiat Professional. Conceived and developed in Italy, Ram’s new van also spent quality time proving itself on this side of the Atlantic undergoing extensive, extreme-duty testing to prepare for its North American debut as the Ram ProMaster. Engineering the new ProMaster for the Ram Truck brand required a number of changes for new capabilities, powertrains, environments, duty cycles and customers. The 2014 ProMaster is available in two roof heights, three wheelbases, and four body lengths. Additionally, the ProMaster offers both a chassis cab and cutaway from the factory. Its unibody frame architecture makes it significantly lighter than the competition. As a result, the ProMaster boasts an impressive best-in-class payload capacity up to 5,145 pounds and a maximum towing capacity up to 5,100 pounds. The gross combined weight rating (GCWR) for the 3.6-liter V-6 is 11,500 pounds and 12,500 pounds for the 3.0-liter I-4 EcoDiesel. A unibody structural has additional advantages, including stability and strength from front to rear, a reinforced plenum area for optimized engine packaging, and “truer” tuning of chassis systems and related hardware when compared to more common body-on-frame applications. 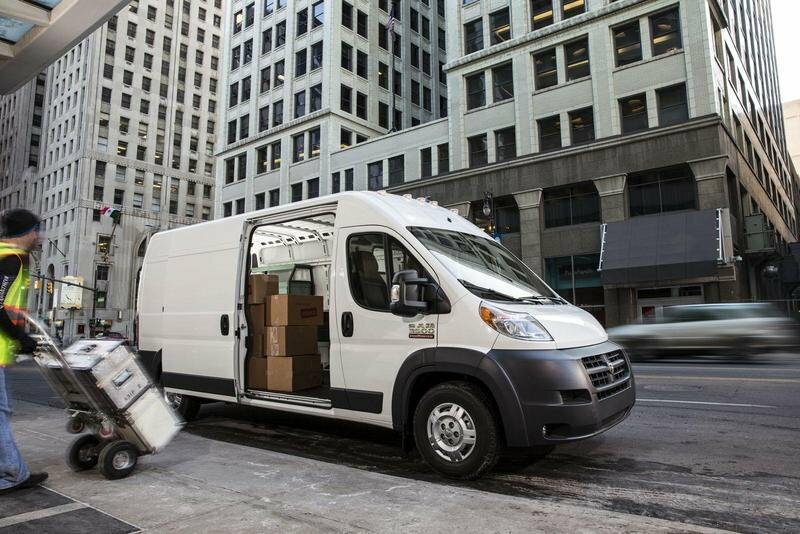 Thanks to its unique front-drive system, body-integral construction and the multiple of configurations offered, Ram’s new 2014 ProMaster can be upfit for virtually every conceivable commercial need. Proportionally, the ProMaster brings a new standard to the large commercial van-based segment. The ProMaster is available in two roof heights, 90 or 101 inches with best-in-class standard roof height and the most vertically oriented side walls in the cargo van category (nearly 90 degrees in relation to the cargo compartment floor). The ProMaster features a standard sliding door on the passenger side with an optional sliding door on the driver’s side. The sliding door openings are based on roof height – 49 inch x 60 inch for the low roof model and 49 inch x 70 inch for high roof models. In the rear, an available two-position rear clamshell door swings open up to 260-degrees, folding almost flat to the side of the van. All three door openings enable fork lift pallet loading and unloading, and spaciousness that leads the competitive set. The standard electronic stability control (ESC) system on the new Ram ProMaster is a sophisticated four-channel (independent control to all four corners of the vehicle) active handling system that links the vehicle’s dynamic control systems to assist the driver in maintaining control under demanding or adverse conditions such as wet, snow-covered or icy roads, tight turns, and evasive maneuvers. In effect, the ESC determines the driver’s intentions and optimizes overall vehicle control to keep the dynamic forces within select limits in any driving situation – nearly transparent so control seems almost intuitive. 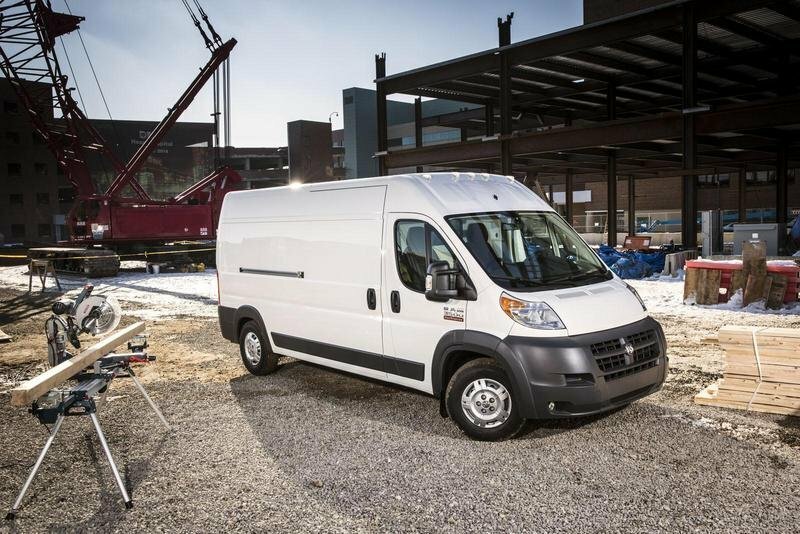 The 2014 Ram ProMaster van’s powertrain lineup features the award-winning standard-equipment, gasoline-fueled V-6 and a torque-laden, I-4 EcoDiesel engine. 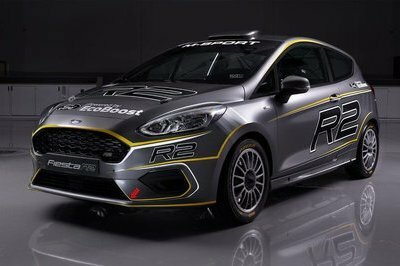 The engines are paired, respectively, with a proven six-speed automatic transmission and an electronically controlled six-speed automated manual. 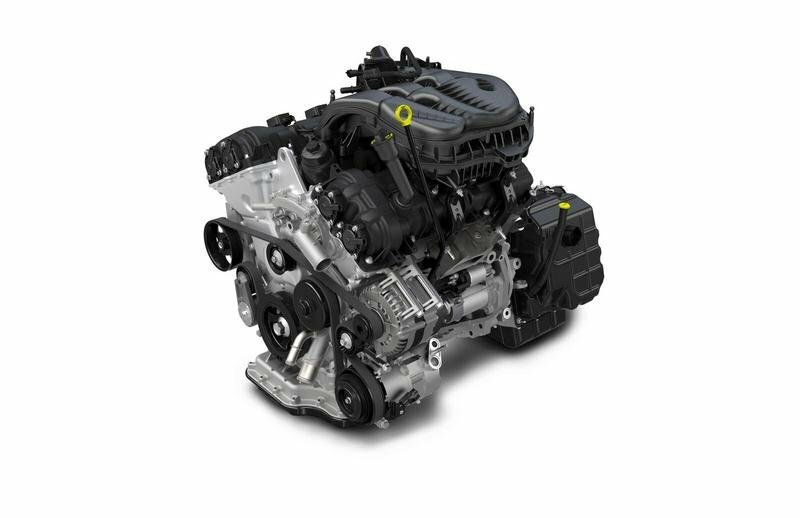 The standard-equipment 3.6-liter Pentastar V-6 is rated at 280 horsepower with peak torque of 260 lb.-ft., the dual overhead cam, 24-valve Pentastar delivers the capability required of a commercial van without compromising refinement – hallmarks that have contributed to its ranking among Ward’s 10 Best Engines for three years running. 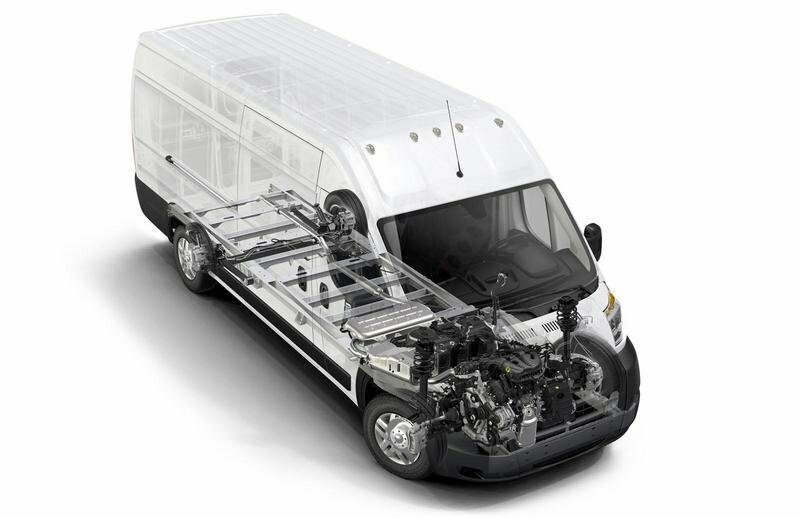 Reducing vehicle operating costs was paramount in the minds of the powertrain engineers who contributed to Ram ProMaster’s development. Recommended oil-change intervals range up to 10,000 miles. But an intelligent oil-servicing system that monitors vehicle usage will trigger an alert when service is most appropriate. The smooth-shifting 62TE automatic transmission is upgraded to accommodate the Ram ProMaster’s prodigious weight ratings. Specifically, its 3.86 final-drive ratio enables comfortable grade transit under full freight. The transmission more readily adopts the most appropriate ratio for a given driving situation. The numerically lower overall top gear ratio delivers a more economical highway operation. The trailer/tow program comes standard with 62TE and the new M40 automated manual, which is not only exclusive to the 3.0-liter EcoDiesel, it stands alone in the Ram ProMaster’s competitive set. The front of the new ProMaster is identified by visually durable bodylines, a broad wraparound bumper and twin-reflector headlamp clusters. True to the Ram Truck brand, the ProMaster leads with a bold, hexagon-shaped crosshair grille, featuring the Ram’s head logo proudly displayed as the focal point of the crosshair. The cab-forward, short dash to front axle design pushes the nose inward and the headlamps upward. This design provides higher passenger seating positions and better visibility – obviously important for commercial users – thanks to a more confident vantage point from which to operate the vehicle. Safety and security were two of the guiding principles followed by engineers throughout the development of the new 2014 Ram ProMaster van. Ram’s new full-size van offers more than 35 active and passive safety and security features. The ProMaster also includes standard ESC, hosting a number of technologies such as trailer-sway control. Security also means notification of the traffic around you. Ram ProMaster features ParkView backup camera and ParkSense with audible warning, all of which are useful when maneuvering a large van. ProMaster customers can make the best use of their valuable time by leveraging Uconnect’s easy-to-learn, easy-to-use interface – acclaimed for its convenience and sensible design. Handsfree calling in the all-new 2014 Ram ProMaster is made convenient via reliable Bluetooth technology. Similarly, the truck’s handsfree text-reply feature enables customers to quickly deliver messages. A full-color, five-inch touchscreen is available with global positioning satellite (GPS) navigation, providing Ram ProMaster customers the ability to chart time-saving routes to their destinations. Uconnect Web, powered by Autonet Mobile, is available to U.S. customers. This system delivers continuous Internet connectivity, creating an efficient workspace and real-time information access on the go.